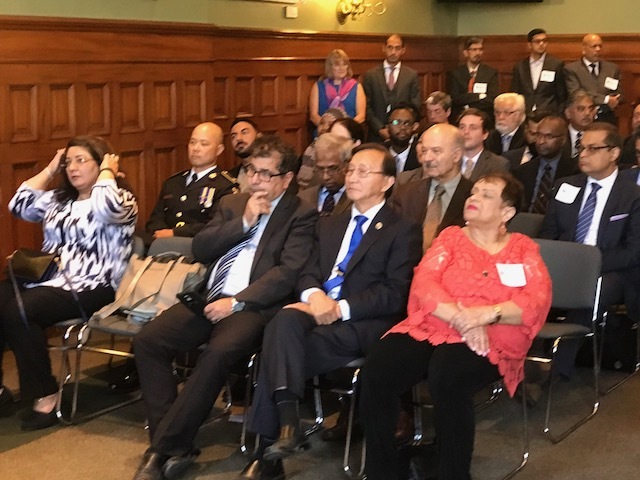 The 21st annual Eid celebrations at Queen's Park were held again in Rooms 228 and 230, 2nd Floor of the Main Legislative building. 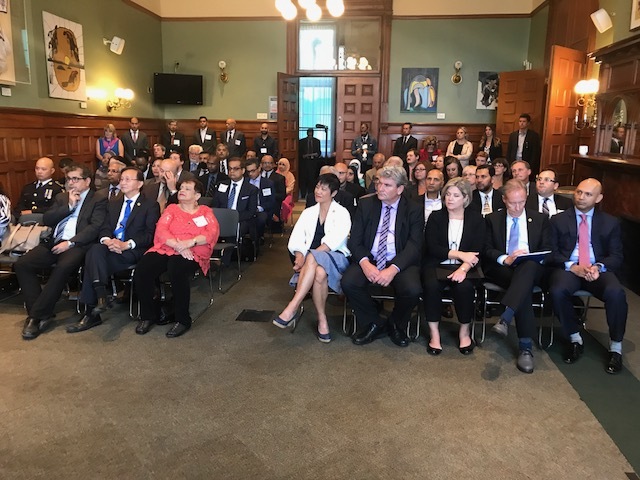 More than 40 Members of the Provincial Parliament from all political parties attended this lunch reception which was held from 11:30 A.M till 1:30 P.M.
Hon. Deb Matthews, Deputy Premier of Ontario attended with several Ministers as Premier Kathleen Wynne could not attend. Hon. 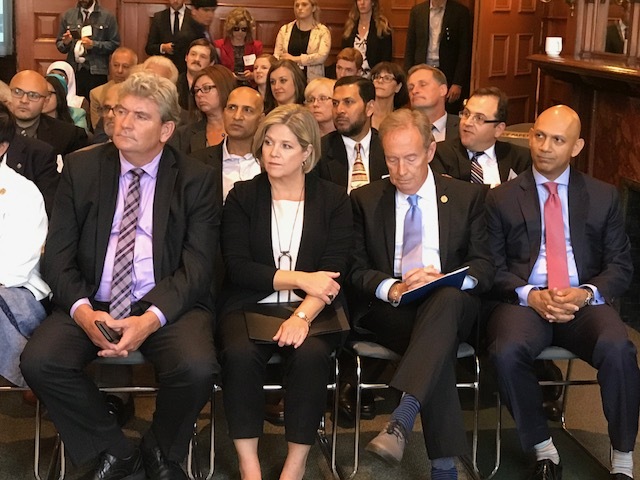 Andrea Horvath, Leader of Ontario New Democratic Party attended with her caucus members. Mobeen Khaja, President of APMC welcomed everyone and shared his time with Yumna Siddiqi, APMC's Secretary General who spoke about the outreach work the Association is doing specially to get youth more involved. This year, we were delighted to have H.E. Nadir Patel, High Commissioner for Canada to India and Ambassador for Canada to Nepal and Kingdom of Bhutan who said few words. Zaib Shaikh, Imam of the CBC's hit show 'Little Mosque on the Prairie' also joined us - he had just returned after performing Hajj. Goldy Hyder, President and CEO of Hill + Knowlton Strategies was also able to attend as he was in town. 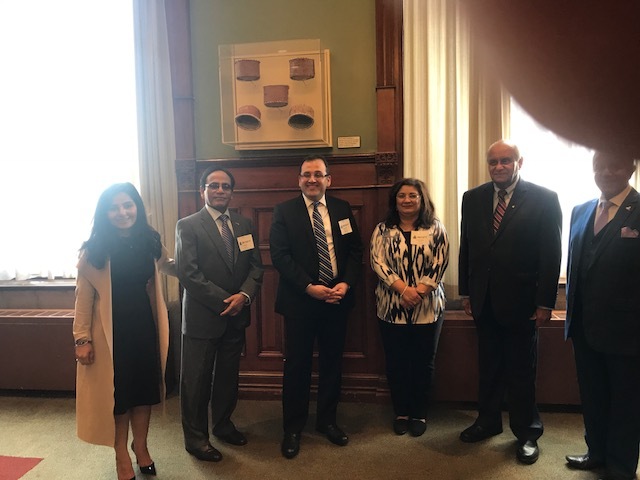 Consul Generals, Mr. Erdeniz Sen of Turkey, Mr. U.L.M. Jauhar of Sri Lanka, H.E. Sultan Al Harbi of UAE, Mr. Hadi Prambrastoro of Indonesia, Ms. Anne Sheshadri and Ms. Jeanne Geers, from Public Affairs, United States, Mr. Bimo Ariawan from the Indonesian Consulate and Mr. Anes Rachid from the UAE Consulate represented the Diplomatic Corps.